Savy Paws is proud to offer all-inclusive lodging for your pets. We will never charge extra for play time or dispensing supplements. We proudly feed Nutri Source Adult Chicken and Rice Formula to all of our guests, but of course you are welcome to bring your own food. We also offer several other grain free or single source flavors as meal options for purchase during your pet’s stay. All pets entering the facility must be current on Rabies, Distemper/Parvo, Bordatella (kennel cough) and the H3N2 Canine Influenza Vaccine. Our largest suite is 6ft X 8ft to accommodate larger breeds or larger families! 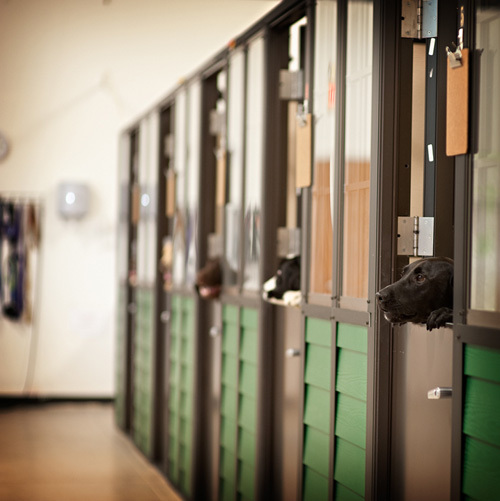 Our standard suites are 4ft X 6ft and house single pets or multiple smaller breeds! Each suite features composite construction meaning your pet will not be able to see or interact with their neighbors while in their rooms. This will ensure your pet’s privacy and safety. All suites also come with an elevated cot and our staff ensures all pets always have access to fresh water. You are welcome to bring items from home for your pet, but please be aware of our items policy located within our sleepover checklist below. These prices are per night. Any dogs sharing a suite must be from the same household. All boarding dogs enjoy their own luxury suite, playtime, and free bath after three nights. *Please note that all dogs sharing a room MUST be from the same household. *Any reservations that coincide with holidays or Cherokee County school breaks require a 3-night minimum stay and a 50% nonrefundable deposit at the time the reservation is placed. Please call or email to place a reservation. When bringing dry food from home, we require all food to be in sealed Gallon Sized Zip Lock bags to fit in your pet’s personal cubby. We do not accept plastic containers or individually packaged meals. There will be a $1 charge if we have to move your pet’s food from a container to a bag. We provide all bowls for food and water. If your pup is a fast eater and needs a slow feed bowl, simply let a receptionist know at check-in. All supplements need to be in the original bottle with the name. Bedding and blankets are optional, but please keep in mind that we do not offer a laundry service. Therefore, if items become soiled, it will be at our sole discretion to discard the items if they are deemed a sanitation hazard. You may also bring toys for your pets though we do not allow rawhides, real animal bones or toys with squeakers as they are a choking hazard.